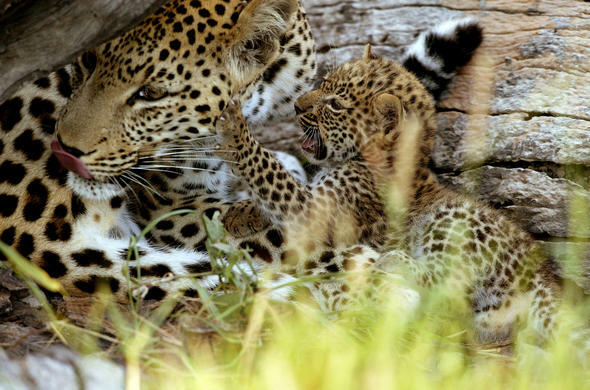 Leopards are one of Africa's most widespread cats, but they are seldom seen due to their secretive and solitary nature. And yet, the chances of seeing them in the Tuli region are strong. It is well known that the Lion is considered the king but it is without doubt that the Leopard is the prince and one of Africa's favourite cats. These solitary cats are physically smaller than Lions but do make up for it in spirit with its inborn cunning and inherent ability to take care of itself.What is amazing about this animal in the Tuli region is that no two Leopards are alike. Its appearance comprises of dark spots on the legs, shoulders and head with rosettes on the remainder of the body providing excellent camouflage against its tawny coat. Leopards are most active at night as its long white whiskers and extra long eyebrow hairs act as sensors in the dark allowing it to navigate the night terrain. These honed senses of acute sense of sight and hearing give it the advantages it needs when hunting.These cats spend their days laying around under the shade of the magnificent massive old trees in Tuli or perched up in the branches of these trees. Leopards are known to be amazing climbers with their razor sharp claws and incredible strength and spend their late afternoons perched in trees scouting the surrounding location for potential prey or just catching a breeze from the summer sun in the lofty treetops. Thereafter Leopards begin to stir and can be seen slinking around river banks sniffing out a tasty bite being it either a hare, mongoose or mouse.This patient and intelligent hunter dines on larger animals hunting them in the utmost stealth and strategy killing game up to the size of Impala or similar sized antelope. The Leopard stalks its prey killing it in one swift attack biting at the nape of the neck, back of the skull or the throat. It is due to the risk, or thought of that risk, of losing its prey that forces leopards to use their immense strength to drag a possible 70kg Impala up a tree to secure its kill.Leopards lead a solitary way of life and are able to survive across a diverse range of environments resulting in them being the most widespread of the larger predators in Southern Africa. The cats are territorial in nature with confrontations between males usually ending in the death of one of the Leopards. Female confrontations however are less likely to end in death as they prefer avoidance rather than confrontation.Although solitary, when the urge to mate arises the cats seek each other out to mate, with copulation occurring within 15 minutes. It is during these times that the cats become vocal growling and snarling at each other which can be heard across the vast plains. The gestation period takes up to three and a half months before giving birth to its cubs which it leaves when it hunts making them vulnerable to predators as they play about. Leopard cubs quickly develop the necessary skills needed to survive alone as they are eventually left by their mothers to their solitary lives by the maximum age of 18months.It is the nature and mystique of these big cats that makes them popular in Tuli as it lives its solitary life slinking through the amazing landscape living in the giant old trees. The Tuli area has thus become renowned for playing host to an array of these majestic creatures and their solitary lifestyle.